Flounder is a saltwater fish with a very delicate flavor. Because the taste is not strong, flounder is not often seasoned very much, in order to avoid overpowering the fish. It is often paired with other seafood, such as crab and lobster meat, because the flavors of each complement one another. Although flounder is more commonly baked or broiled, it can also be prepared on the grill. It offers a slightly greater challenge than other fish because it can easily fall apart on a grill and needs to be cooked with care, but a little preparation can make the grilling process easy. Preheat the grill to medium heat, about 350 degrees F.
Apply any seasonings to the flounder, if desired. Lemon juice, black pepper or other herbs are common seasonings used with this fish. Place the flounder on a perforated grilling sheet and cover it with aluminum foil. If you don't have a grilling sheet, place the flounder on three sheets of aluminum foil after the top layer has been greased with olive oil. 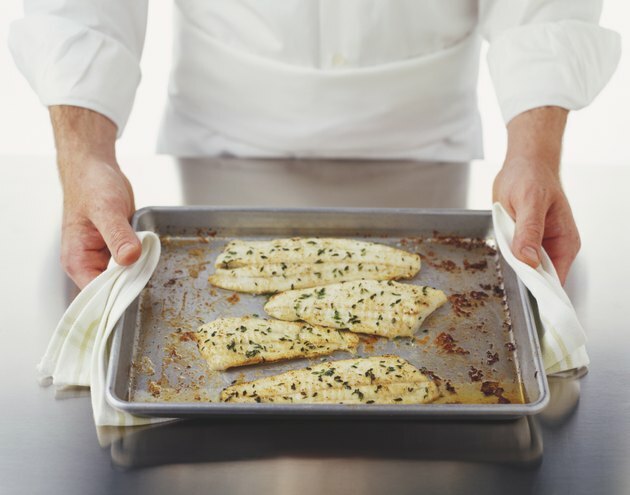 Cook on the grill for 35 to 40 minutes, or until the flounder reaches an internal temperature of 140 degrees F. Remove from the grill and serve. Flounder falls apart easily when grilled, so it is important to take care when grilling the flounder. In addition to using a perforated grilling sheet or aluminum foil, you should avoid flipping the fish while grilling it, because it can fall apart. Grilling the fish skin-on will also help hold the meat together.